Remember that last film in the Nightmare on Elm Street Collection? The last in the original story arc, not New Nightmare. What was it called again? Oh yeah, Freddy’s Dead: The Final Nightmare. Sound familiar? It should, because both Friday the 13th and Nightmare on Elm Street have an eerily similar title to the end of the arc’s original story. I think this was actually on purpose, given the plans that this film had in order to transition into the world of Freddy Krueger. You’ll see what I mean. Jason Goes to Hell: The Final Friday is Jason’s real final story. As I originally wondered, we do in fact return to Crystal Lake for this final film, but how did Jason come back to life after apparently melting into nothing in the last film? Well, unfortunately, that’s not really clear, but whatever melted him must have been mixed with some fresh Rogaine, because the big guy grew some hair back. Good for him. You’ll be surprised to find Mr. Vorhees was put into a trap in the beginning of the film by secret agents awaiting him at Crystal Lake. I guess that stunt in New York made him nationally known. After killing Jason, his mutilated body is sent to the morgue for examination. Only then does the medical examiner lose his mind and chomp down on Jason’s heart, obviously transforming him into the new and improved Jason Vorhees. It is up to a mysterious bounty hunter to discover the secret to Jason’s miraculous comebacks and stop him for good. I will be the first to say that I was surprised in a good way to find the army waiting for Jason at Crystal Lake. That was a bold and smart way to change things while still keeping Jason’s M.O. intact. That, and how are you supposed to start a story anyways? With a hook. Because this film actually had one, I felt myself wanting to watch it. The story then continues to progress and tell the audience a very detailed explanation on why Jason lives, how Jason lives, what he’s trying to do, and how to stop him. I have to say this is really the first time I have found myself interested in the fullness of the story. I can’t believe I’m saying this. This film had substance. It may have been grasping at straws, but something is better than nothing, and nothing is what the other films had. 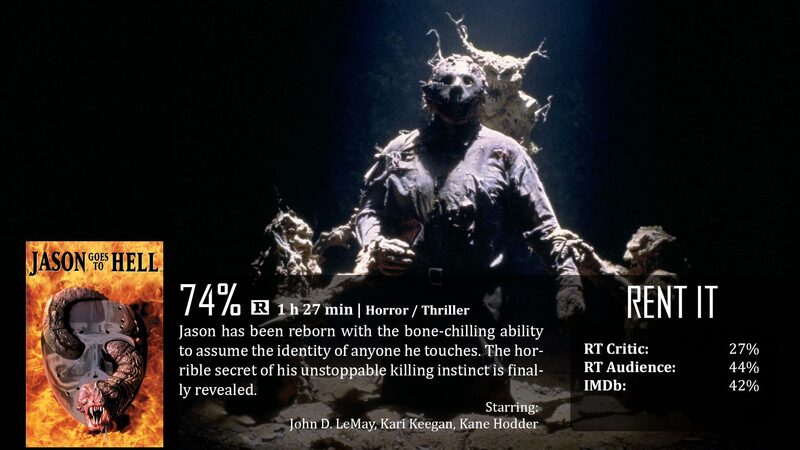 Now, the film lists Kane Hodder as Jason, but honestly different people play Jason’s vessel through a similar technique seen in Invasion of the Body Snatchers. I can see a lot of people dissing it because of that. They went to see Jason, not these random people who act like him. That being said, I was getting tired of the same old with Jason, and now and then I welcome change, and there is a lot of change that this film has to offer. You know what? I like it. It doesn’t make a ton of sense with the rest of the series, though, and that does hurt it. What also hurts it is in general…this movie doesn’t feel like Friday the 13th…it really does feel like Invasion of the Body Snatchers. Not only does Jason take other bodies, but he doesn’t even use murder weapons really. It’s like a zombie/alien movie…it’s weird. Instead, it forces you to keep the fact that it’s Jason in the back of your mind, which for a really simple series like this, may prove difficult for some. What does that make this film? Overall…confusing. As promised, I’ll explain the whole…tie-in to Freddy vs. Jason. For those of you that avoid spoilers, please refrain from reading this paragraph… At the end of this film, our main heroes destroy Jason with a special “Vorhees” dagger, sending him forever into Hell. For good. At the very end of the film, Freddy Krueger’s knifed glove protrudes from the ground and steals Jason’s mask, ending the film with a sinister laugh, hinting at what’s to come. So even though Jason X was released before Freddy vs. Jason, the latter was originally intended to be released first, so I will watch it how it was originally meant to be seen. Also…will be nice getting back into the spirit of A Nightmare on Elm Street. Overall, Jason Goes to Hell: The Final Friday definitely ignored just about everything the other films taught us, and it doesn’t make a lot of sense for the series, but it was done well. 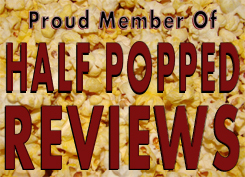 Part of how I review at least somewhat includes if the film can be seen as a standalone project, and for the most part it can. As a movie done all on its own…it did surprisingly well in my book.